Thanks for both reply's. Sounds like even the free trial is not having. You can always get a free trial of the 'Premium' and 'Premium+' services from TVPlayer but, if it's specifically 'Eurosport' that you intend to use it for, you should bear in mind that Eurosport 1 &amp; 2 are not available during the free trial period. Nor are Alibi, Eden, Gold, Good Food, W, or FOX HD... although, if you are prepared to skip the trial and forego the initial free month, you can just log into your 'TVPlayer' account to opt out of the trial and get immediate access to any/all of them. 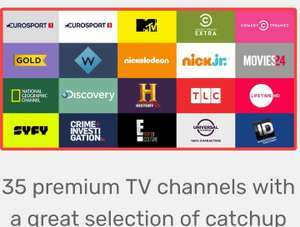 As others have said, 'FreeSports' was dropped on 6th March 2019, after already having dropped 'QVC' plus 'CNN' in February, and 'TVPlayer' have also stated that 'Boomerang', 'Cartoon Network', and 'Cartoonito' will leave the service on 22nd March. On top of that, the 'ITV' offshoot channels like 'ITV2', 'ITV3', 'ITV4', 'ITVBe' and 'CITV' are no longer part of the basic free 'TVPlayer' service, meaning you will need to have (at least) the £6.99 per month 'Premium' plan to watch those with 'TVPlayer' and, if you want the remaining kids channels as a new subscriber, you must now pay £9.99 per month for the 'Premium+' plan! According to 'TVPlayer' much of this has been attributed to the increased cost of licensing those channels... which is fair enough but, all things considered, I wouldn't really recommend their service - especially after I was supposed to get three months free when I signed-up through an offer they did with Roku in the past and they only gave me one month before charging me! Needless to say I cancelled and, in fairness to them, 'TVPlayer' did refund what they charged me - but, suffice it to say, I won't be going back to them. Currently enjoying all that 'Eurosport' has to offer via 'Eurosport Player' for just £0.01 (i.e. one pence) per month over a six month period, which was a deal I got through Amazon Prime, but IDK if it's still available. Few months ago I got 3 months free with a deal on here, cancelled after half of hour due to the lack of HD for the most of the programs, even for the ones listed as HD. Sorry op, but people should avoid, this is like 20 centuries television. Not sure why this has expired when its still working! First TV program I tried to watch wouldn't load. Instead I got a message saying the channel was unavailable on trial.. Tried another TV program, same message. What's the point in a trial of premium content if you can't use it? Anyone else have this? There was an update to the box back in 2010 so up to 2 pixels now. Existing Roku owners - factory reset to get 3 months TVPlayer for free! 2 weeks later after I thought I had reset my very old Roku stick for nothing my 3 month free TV player email arrived today. Have to agree with you. The email offer says Plus but no mention on the TVPlayer website about Plus, just Premium. I assume Premium is the new name for the Plus package. If you go to https://tvplayer.com/plus it shows Premium. And * to say UKTV channels, Fox HD, Eurosport 1 &amp; 2 not included in free trial. So does the Roku offer give a 3 month free trial of all the channels, or does it exclude those the channels above which you don't get during the one month free trial they offer. Movie Box Red, or Movie Play Red ... I'll definately be searching for that now too, lol. Thanx. Ps. Sorted ... Pps. And Movie Play Red seems to be the general consensus name for it now too. Hehehehehe, excellent!!. :-D Thanx, and I'll look forward to it too, etc, lol. How can TV Licencing (BBC) track you and see what you buy with your payment card? that would mean they can see what I buy on Amazon and the shop down the road. they can't track you and see that you've bought something on your card. not unless somebody passes on those details to them. Hit and miss with a vpn it should do. 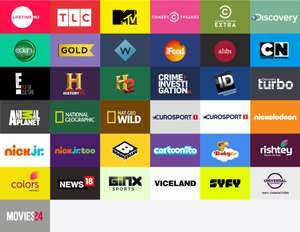 This technically is iptv it really depends what you want from a package, this offers 35+ premium channels such as SYFY, Universal, Discovery etc Also has options to add kids tv, boxnation if you want has itv boxoffice too. It is working for me right now, I am watching Movies 24 on my htpc, and yesterday Eurosport 1 was on all day via the app on the roku streaming stick plus. The service has been more temperamental lately than before, more buffering, but I think that's my lousy internet and the world cup, as i have been having problems with Eurosport player and Videostream for Google Chromecast. Crime and ID are always rock solid for me. Overall I find TVplayer really good. I'd be using a VPN with anything illegal otherwise you'll eventually be getting a letter from Skys lawyers I'm sure, same as they do if you bit torrent without protection these days. Yes I have it installed on a Nvidia shield and it works well with no or little buffering - Just need to use APKpure to download and install it .. i think the icon is added to the home screen. This is Despite subscribing to this deal for a family member. Would it work on a nvidia shield ? 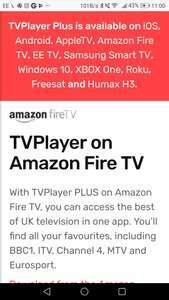 Google 'LIVE NET TV', and download this app, it will give you all the sky TV you need &#x2795; loads more, just enable unknown sources and follow the instructions and in minutes you will have it. £59.99 put code in still £59.99 it's a no from me. Tried the free version last night - no issues with quality on my 12Mbps BT broadband (ends in 30 days :) ). If they redo this offer, I'll be all over it as I love NatGeo &amp; Discovery! Hello again! Do you use the free or paid TVP? Wondering if the ads a) come out of your data (three warn that they might - guessing it depends on where they are hosted; TVP or elsewhere) &amp; b) are there many. Having just bought a 3 mifi, this is very interesting! TVPlayer said they're refunding the discrepancy so that's good. The free service has been very useful in the past when my mother had an extended stay in hospital. The TV there was very expensive but the Wifi was free, so she used TVPlayer on her iPad for free instead. It was very reliable. Hope the paid channels lives up to previous experience. Well yes. Indeed. During checkout it said "50% off full price". Who is to say "full price" of annual isn't £59.99. The annual price has never been more than £59.99 And at the very least they should show the price during checkout. Who doesn't show the price during checkout! Wasn't even shown on the confirmation either.